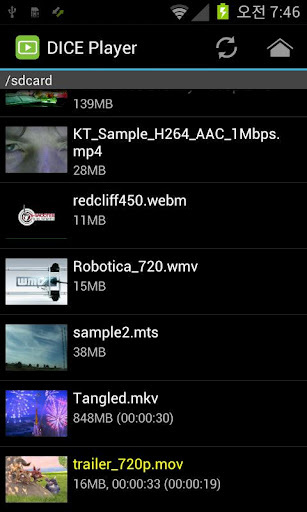 Overview: Diceplayer is a HW accelerated Media player for android. It use HW video decoder at various containers and audio codecs combination. Dual Core/High end devices ( Sensation , Galaxy S/S2 , Nexus-S ) can play 720p MKV/AVI. Diceplayer drains less bettery than SW based players. Honeycomb tablets can play 720p MKV with Full HW accelerations. If you use CM7 or unofficial ROMs that can not play MKV using default player, Diceplayer is the best solution. => May need libOmxVdec.so patch. * Motolora Defy : 720p capable but Gingerbread required. * LG Optimus 2x,Moto Atrix : video capability depends on your firmware. 4. Run Diceplayer, you will get license check fail message and exit. Then run it again (or change the timezone in system setting), the problem will be solved, enjoy.